Hardwood floors are sturdy, long-lasting and—most of all—meant to be walked on. That doesn’t mean they don’t endure the normal scuffs and scrapes of everyday use. After time, getting your hardwood floors refinished could be beneficial, not just to the aesthetics of your living or working space, but to protect the wood and keep it stronger for a longer period of time. If you’re considering getting your hardwood refinished, consider hiring an experienced professional. Scratches, scuffs and scrapes are the most obvious signs for the need to refinish. Another thing to look out for is if your floor is absorbing water as opposed to repelling it. This is a sign the wood fibers are exposed and can cause more permanent damage when untreated. It is also important to bear in mind the refinishing hardwood means shaving down a layer of the wood, so thin floorboards may need a different kind of treatment. When preparing for your refinish, a professional consultant will assess your hardwood for compatibility with the procedure. To get ready for a refinishing treatment, you’ll need to remove any furniture from the area and clean the floor thoroughly. The current finish, along with any old stains, will need to be sanded down and buffed several times so that it is clean, smooth and level. After the sanding, there is the opportunity to stain the floor to give it a new tint and look, you can opt for a rich brown or a light cherry, or keep the wood natural. 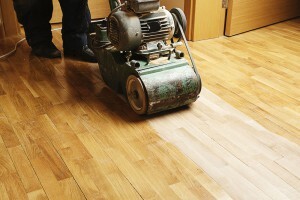 After the stain is dry, the sealant is applied to give your hardwood flooring a waterproof finish and a beautiful glow. While refinishing could be a DIY process, it involves tools and technical procedures that are better done by professionals. Leveling an entire hardwood floor is very difficult, as is getting an even stain and finish. Choose a professional, like CT Floor Supply, to ensure you get the best refinishing job possible.